Twas the night before Christmas, and all through the league, not a player was balling, not even Jeff Teague. The Most Improved Player Rankings were crafted with flair, in the hopes that somebody -anybody – might care. DeMarcus Cousins was nestled all snug in his bed, while visions of craziness danced in his head. Nene in his kerchief, John Wall in his cast, the Wizards settled down for their long winter’s nap. When from TD Garden, there rose such a clatter, I sprang from my laptop to see what was the matter. What to my wandering eyes (I have NBA League Pass) did appear, but a man with a ‘fro on a team named for deer. With a monstrous wingspan and armpits so hairy, I knew in a moment that it must be Sanders, Larry. He scored 17 points and grabbed 20 boards; Tommy Heinsohn was so angry, he blew his vocal chords. Sanders was jolly and bounced all around, but after 53 minutes, the buzzer did sound. 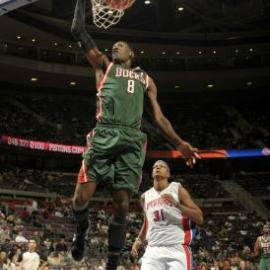 Now that that’s over with, I wanted to mention that I think Larry Sanders is mad at me. When Chris Bernucca ran this column, Sanders was a fixture in the top five. But since I took over, he’s gotten nothing. So that’s why he went off like he did, putting up a poem-worthy 17 points and 20 boards at Boston on Friday. It was a classic rebellion against the man, and I sure took notice. Sorry, Larry. George Hill of the Pacers also deserves some credit for the season he has had, picking up the slack for Danny Granger. Hill is averaging 15 points and 5 assists per game, way up from the 9 and 3 he averaged last year. So he has worked his way onto the Watch List. And one more thing: I’m now calling Jrue Holiday “the Jruth”. Just be aware.